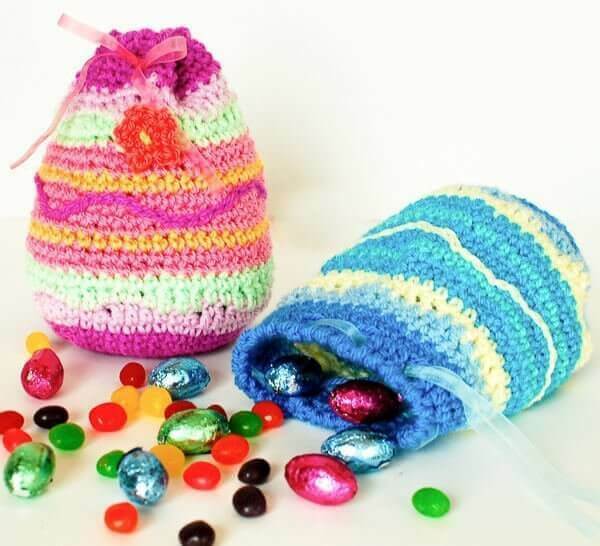 These Easter egg treat bags work up so quickly and are perfect for filling with Easter treats! 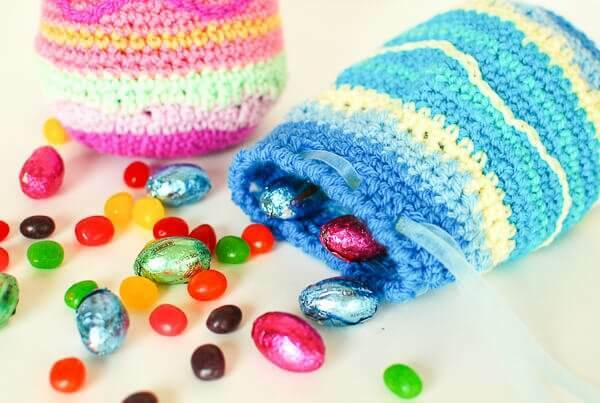 Or perhaps even put a different spin on it … think cute Easter purse or large stuffed Easter eggs! Finished treat bag measures approx 6 in. high. With CA, make a magic ring. (as an alternative to the magic ring, you can ch 4 and join with a slip stitch in furthest chain from hook to form a ring). Rounds 8 and 9: Ch 1, work 1 sc in same st as join and each st around, join — 42 sts. Round 10: Join CB, ch 1, work 2 sc in same st as join, 1 sc in each of the next 6 sts,*2 sc in next st, 1 sc in each of the next 6sts, rep from * around, join — 48 sts. Round 11: Ch 1, beginning in same st as join, *work 1 sc, 1 hdc in next, 1 dc in each of the next 2 sts, 1 hdc in next, 1 sc in next, rep from * around, join — 48 sts. Round 12: Join CC, ch 3 (counts as dc), 1 hdc in next, 1 sc in each of the next 2 sts, 1 hdc in next, *1 dc in each of the next 2 sts, 1 hdc in next, 1 sc in each of the next 2 sts, 1 hdc in next, rep from * around, end with 1 dc in last st, join — 48 sts. Round 13: Ch 1, work 1 sc in same st as join and each st around, join — 48 sts. Rounds 14 and 15: Join CD, ch 1, work 1 sc in same st as join and each st around, join — 48 sts. Round 16: Join CE, ch 1, work 1 sc in same st as join and each st around, join — 48 sts. Rounds 17 through 19: Join CD, ch 1, work 1 sc in same st as join and each st around, join — 48 sts. Round 20: Join CE, ch 1, work 1 sc in same st as join and each st around, join — 48 sts. Round 21: Join CD, ch 1, beginning in same st as join, *sc2tog, 1 sc in each of the next 6 sts, rep from * around, join — 42 sts. Round 22: Ch 1, work 1 sc in same st as join and each st around, join — 42 sts. Round 23: Join CC, ch 1, beginning in same st as join, *sc2tog, 1 sc in each of the next 5 sts, rep from * around, join — 36 sts. Round 24: Ch 1, beginning in same st as join, *work 1 sc, 1 hdc in next, 1 dc in each of the next 2 sts, 1 hdc in next, 1 sc in next, rep from * around, join — 36 sts. Round 25: Join CB, ch 3 (counts as dc), 1 hdc in next, 1 sc in each of the next 2 sts, 1 hdc in next, *1 dc in each of the next 2 sts, 1 hdc in next, 1 sc in each of the next 2 sts, 1 hdc in next, rep from * around, end with 1 dc in last st, join — 36 sts. Round 26: Ch 1, work 1 sc in same st as join and each st around, join — 36 sts. Rounds 27 and 28: Join CA, ch 1, work 1 sc in same st as join and each st around, join — 36 sts. Round 29: Ch 2 (counts as hdc), work 1 hdc in each of the next 2 sts, ch 1, skip next st, *1 hdc in each of the next 3 sts, ch 1, skip next st, rep from * around, join — 36 sts. Round 30: Ch 1, working back along sts just made, work 1 rev sc in each st and each ch-1 sp around, join — 36 sts. Weave a piece of ribbon through the ch-1 sps of Round 29. If desired, add an accent or design using a surface stitch around the middle of the bag or adorn with a pretty flower. Click here for small flower pattern. Can this be done in a continuous round? Hi Amber 🙂 Yes, it definitely can be done in continuous rounds. The only drawback would be that if you were doing stripes, the colors wouldn’t join together in the same round but would “break” into the next color. Make sense? Quick and cute. These would also make great little jewelry pouches. These are so cute. What brand of yarn did you use? Super cute! Thanks so much for linking up on Hookin On Hump Day! These are so cute! I also love how easy they are! These are so cute, Kara! I love the colors you used and how the bag is shaped like an egg. Thanks for sharing at Hookin On Hump Day! Kara this is a great idea 🙂 They are so bright! You could do Hallowe’en ones too! Or Christmas! Awesome idea! Very very very cute! It is sweet of you to share the pattern!